Already Booked Through Disney? Find Out How to Get More! Did you know that you can receive incentives even if you’ve already booked your vacation directly through Disney? Simply TRANSFER any existing reservation made directly through Disney that is within 30 days of the initial booking and has not yet been paid in full to The Magic For Less Travel. Plus, when you transfer or book a reservation with The Magic For Less Travel, there are never fees of any type, and you’ll be assigned a travel counselor to answer all of your questions, provide you with magical tips for your trip and make your Advanced Dining Reservations. To discover what incentives your reservation may qualify for and any restrictions that may apply, please contact The Magic For Less Travel for details. Book a Disneyland package or transfer an existing Disneyland package reservation of $750 or more and receive a $25 Disneyland Resort Gift Card. Guests who book a Disneyland package of $1500* or more with The Magic for Less Travel and receive a $50 Disneyland Resort Gift Card. 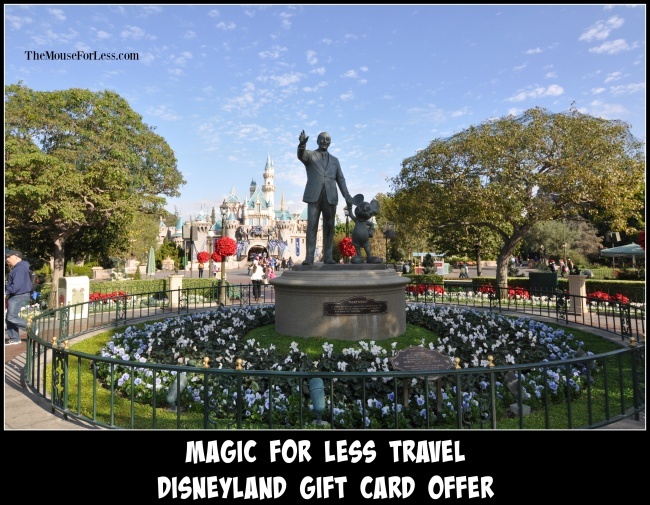 Book a Disneyland package of $3000 or more with The Magic for Less Travel and receive a $75 gift card! The gift cards are accepted at many Disneyland Resort shopping and dining locations and can be used to pay for shopping, dining and even theme park admission. We are sure you will find a way to put the gift card to good use! *This promotion is valid for new and transferred Disneyland package reservations booked with The Magic for Less Travel. This is valid for the on-site Disneyland resort packages as well as the Good Neighbor hotel packages priced at $750 or more before taxes, airfare and other non commissionable package components. This offer CAN be combined with other Disney package offers and discounts. Due to customs restrictions, we can not send Disney Gift Cards to guests located outside the US. International guests will receive a $25 e-mailable Gift certificate to Amazon or another e-mailable gift certificate. Those considering a trip to Disneyland AND the surrounding area should consider a Disney Southern California Adventure by Adventures by Disney, which includes a visit to Disneyland and other area highlights AND qualifies for a Gift Card valued at up to 5% of your vacation price when you book through The Magic For Less Travel (use quote button below to obtain additional info and pricing). tay in the middle of the magic of the Disneyland Resort in late spring or early summer! Save on stays most Sunday through Thursday nights from April 14 through May 23, 2019 at a Disneyland Resort hotel. Book through May 20, 2019. Travel must be completed by May 24, 2019. Interested in creating a vacation package? Consider adding theme park tickets to this room offer. Staying at one of these Disneyland Resort hotels makes it easy and convenient for your family to experience all there is to see and do at both parks. Plus, each day during your stay at a Disneyland Resort hotel, you’ll receive benefits and a host of welcoming amenities with distinctive Disney touches that will enhance your overall experience. Savings based on the non-discounted price for the same room at the same hotel for most Sunday through Thursday nights from 4/14/19 through 5/23/19. Book from 2/26/19 through 5/20/19; travel must be completed by 5/24/19. Limit two (2) rooms per reservation and occupancy restrictions apply. Kid-size Disneyland Good Neighbor vacation package! Stay just minutes from the magic at a nearby Good Neighbor Hotel, plus enjoy special package extras that will make your Disneyland® Resort vacation even more unforgettable. 2-night/2-day room & ticket package for a family of three. This package is based on two adults (age 18+) and one child (ages 3–9) in a standard room at the Holiday Inn Anaheim Resort Area hotel with 2-Day (1-Park per day) Disneyland® Resort Theme Park tickets. For most nights 4/28/19-5/18/19, 9/2/19-9/18/19, 11/3/19-11/22/19. *Subject to availability as the number of rooms allocated for this package may be limited. Prices subject to availability, room type, Hotel and travel dates. Excludes all applicable fees. Other room rates and other Hotel rates will vary. Advance reservations required. Everyone in the same room must be on the same package. Tickets are valid for one Theme Park per day, must be used within 14 days of first use and each day of use of a ticket constitutes one (1) full day of use. Tickets may not be sold or transferred for commercial use. Subject to change without notice. Blockout Dates and other restrictions apply. Not valid with any other discounts or promotions. Tickets valid for use beginning January 7, 2019 and expire 13 days after the first day of use or on May 23, 2019, whichever occurs first. The following blockout dates apply: April 14 through April 22, 2019. For a limited time, you can visit the Disneyland Resort theme parks for as little as $70 per day when you purchase a 3-Day, 1-Park Per Day Ticket ($210). Plus, one Magic Morning early admission* is included with each ticket. You can also add Disney MaxPass** for an additional $10 per day. These tickets are valid for use beginning January 7, 2019 and expire 13 days after the first day of use or on May 23, 2019, whichever occurs first. The following blockout dates apply: April 14 through April 22, 2019. Tickets and Disney MaxPass are nonrefundable. Purchase from November 20, 2018 through May 18, 2019. Each day of use constitutes one full day of use. May purchase up to 8 tickets per person per day. Tickets are nonrefundable, may not be sold or transferred for commercial use and exclude activities/events separately priced. *Magic Morning allows one admission into selected attractions to Disneyland Park one hour before the park opens to the general public on Tuesday, Thursday or Saturday. Each Guest must have eligible theme park admission. To enhance the Magic Morning experience, it is strongly recommended that guests arrive at least one hour and 15 minutes prior to regular park opening. Magic Morning admission is based on availability and capacity. Applicable days and times of operation and all other elements including, but not limited to, operation of attractions, entertainment, stores and restaurants and appearances of characters may vary and are subject to change without notice. Subject to restrictions and cancellation. **Disney MaxPass is nonrefundable, nontransferable and may not be redeemed for cash. Guests are strongly advised to check the day’s FASTPASS availability and other park details before purchasing Disney MaxPass or using a park ticket with Disney MaxPass. FASTPASS selections for popular attractions or entertainment may not be available at the time of Disney MaxPass purchase or use as FASTPASS selections are limited and availability is not guaranteed. FASTPASS selections may be made only while you are in the parks, and may change without notice. Disney PhotoPass service is subject to the Disney PhotoPass terms and expiration policy found at https://disneyland.disney.go.com/photopass-terms-conditions/. Online registration required. Disney PhotoPass photos captured during the day your Disney MaxPass feature is used must be linked to your Disney account. Not responsible for missing, lost or damaged photos. Downloads are restricted to personal use by Disney account holder only and may not be used for a commercial purpose. The Disney MaxPass feature will expire at the end of the day of use. Subject to other restrictions and change or cancellation without notice. Sponsor: Looking for travel insurance to cover those unexpected travel woes? Compare InsureMyTrip with any other travel insurance you are considering. You won’t find the same travel insurance plan for less. InsureMyTrip guarantee your quote through them is the best price available for any matching plan across the industry. Disney Visa holder receive discounts on merchandise, dining at select locations, guided tours and more at the Disneyland Resort. Check your card information for complete details. At this time there is not a resort discount for Disney Visa holders at Disneyland Resort, but keep looking. Offers change periodically. To book this offer, you must be an active or retired member of the U.S. military, including the National Guard, Reservists, the U.S. Coast Guard, the Commissioned Corps of the Public Health Service (PHS), and the Commissioned Corps of the National Oceanic and Atmospheric Administration (NOAA). Spouses of military service members also qualify if they are able to present valid and active U.S. military IDs in the absence of active military personnel or Commissioned Corps Members. Minimum length of stay requirements may apply. Check-in date must fall within valid offer travel dates, and travel must be completed by December 20, 2019. Valid for Eligible Service Members or spouses for travel between January 1 to December 19, 2019. Book from October 4, 2018 through December 19, 2019, with travel completed by December 20, 2019. “Eligible Service Members” are active or retired members of the U.S. military, including the National Guard, Reservists, the U.S. Coast Guard, the Commissioned Corps of the Public Health Service (PHS), and the Commissioned Corps of the National Oceanic and Atmospheric Administration (NOAA). Offer excludes select Concierge rooms and suites, except Paradise, Artisan, Junior and Regal suites. Eligible Service Member or spouse must present a valid military identification at check-in. If valid military ID is not presented, the non-discounted room price will be charged for the duration of the stay. Offer is nontransferable, and Eligible Service Member/spouse must stay in the room. Not valid on previously booked rooms. Advance reservations required. Limit two (2) rooms per reservation and occupancy restrictions apply per room. 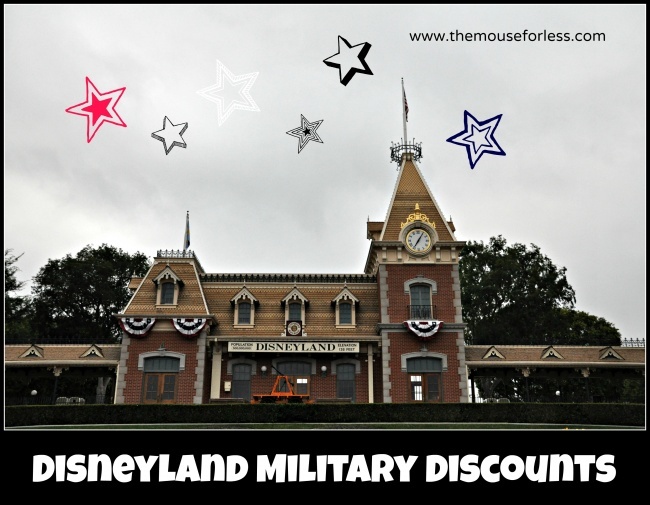 Disneyland Resort is saluting active and retired U.S. military personnel by offering Military Promotional 3-Day and 4-Day Park Hopper Tickets. You can visit both theme parks each day of your ticket! This product can only be purchased at Main Street Photo Supply Co. in Disneyland Park or at Kingswell Camera Shop in Disney California Adventure Park. For additional information, visit disneymilitaryoffers.com. Occasionally, Disneyland offers special promotions for Annual Passholder; discounts can be up to 40% off. When offered, these special promotions are available on select Disneyland Resort hotel rooms on select dates. 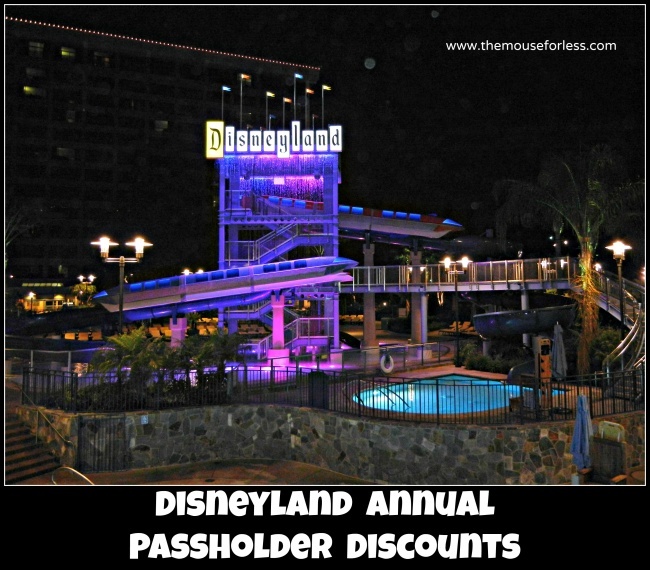 In general, Annual Passholders receive a 10% Disneyland hotel rooms discount, subject to availability. Discounts may not be available during peak times of the year. Rates are lowest on Sunday through Thursday nights. Hotel Guest must be a valid Annual Passholder at the time of stay. Valid Annual Passport must be presented at check-in and Passholder must stay in the room. Limit two (2) rooms per Annual Passholder per reservation and five (5) people maximum per room. Not valid in combination with any other discounts or offers. 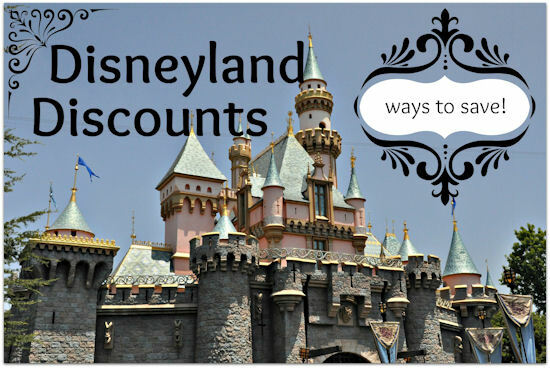 To learn how to get GREAT Disneyland ticket deals from ARES Travel and save $5 per ticket! Visit our Disney Ticket page for more info or to purchase. See other great Disneyland packages and rates offered by The Magic For Less Travel OR visit or our Disneyland Ticket Discount page.